Kindergarten at my school, as I'm sure they do in many schools, studies a letter a week. 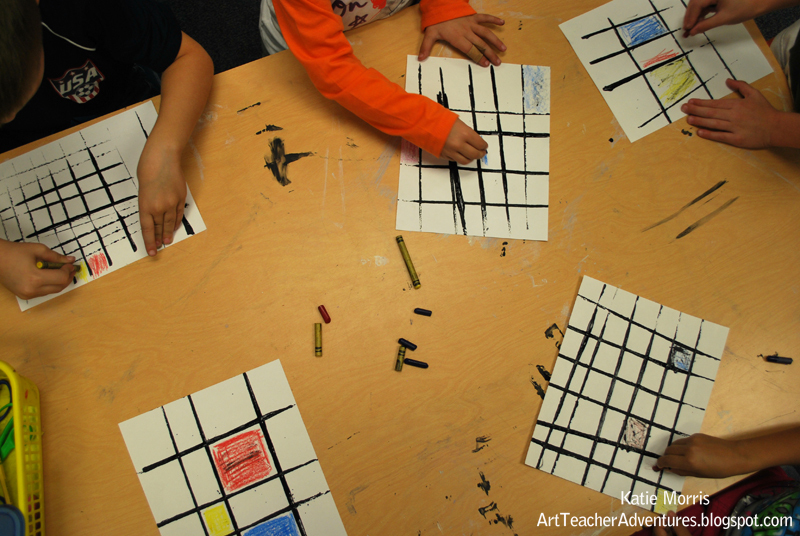 A couple months ago for "M" week, I wanted to do an Art lesson that incorporated the letter. At first I had "magenta monkeys" in my head but I never came up with a lesson I was excited about. Then one day I had some extra liquid paint from a lesson with paint droppers and not wanting to waste the paint, I decided to play! 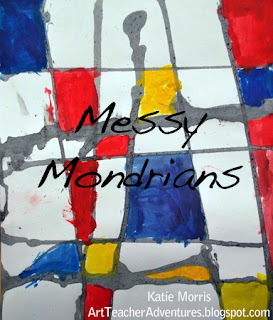 I came up with an idea that I really like: Messy Mondrians. 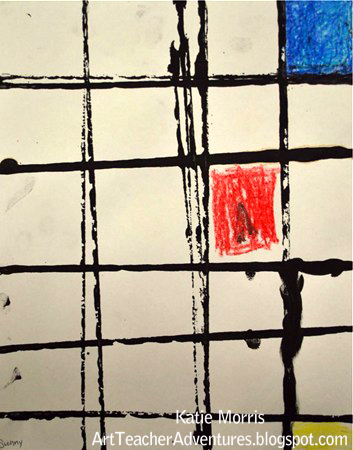 Most classes used paint droppers* to drip horizontal and vertical lines of black paint across their papers in the first class, after the Mondrian introduction and discussion, of course. 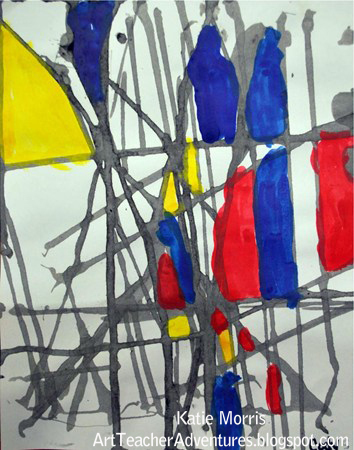 In the second class, they were given only the primary colored tempera cakes to paint in their shapes. 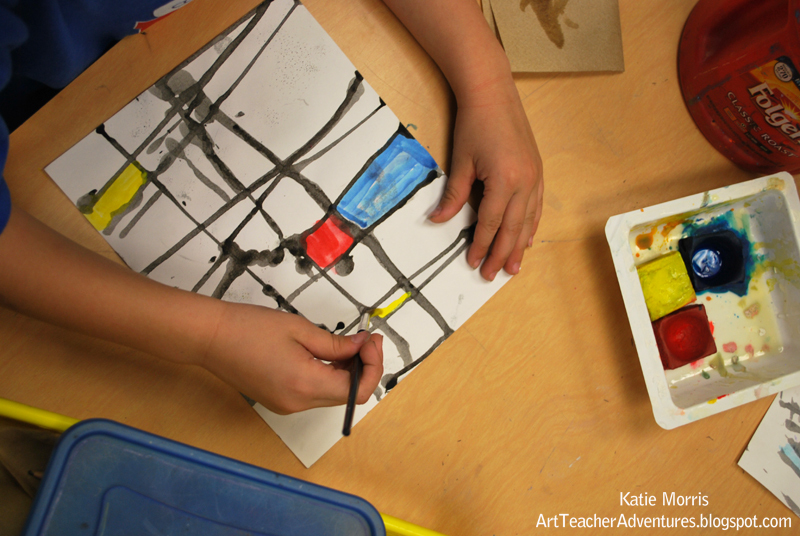 A few classes used cardboard to stamp horizontal or vertical lines and colored with primary colored crayons. 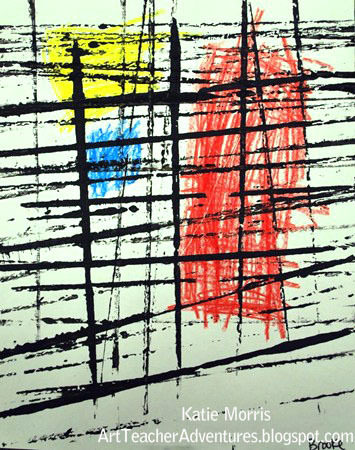 I prefer the dripped artwork over the stamped but uneven scheduling with two classes, and students who were too chatty in another, meant changes were necessary. I wish I would have checked the diluted paint for the droppers more carefully because I added a little too much water and it ended up gray instead of a rich black..
*Some people might think I'm a little crazy for giving Kinders paint droppers. For the most part it was fine. I did have one little mishap. 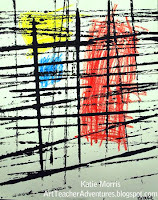 As I was describing how you only need to squeeze a little bit of paint at a time on the edge of your paper and let it drip to the other side, I was holding a dropper full of paint in the air in front of me, and a little boy who can't always control his impulses shot his hand out and squeezed the dropper, splattering black paint all over the table and one little girl's paper. He immediately said "Sorry!" but I was stubborn and didn't let him use his dropper independently since he had shown poor judgment. At first he was upset but I went on helping other students and told him when he was calmed down, I would help him. 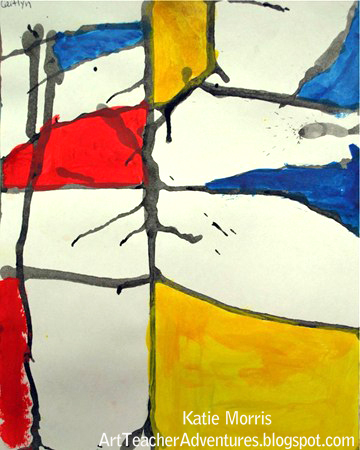 He came to get me a few minutes later and I had him direct me as I dripped paint exactly where he pointed for one side of the paper, then I held the dropper with him and let him squeeze the paint on the other. I just LOVE this, Katie! 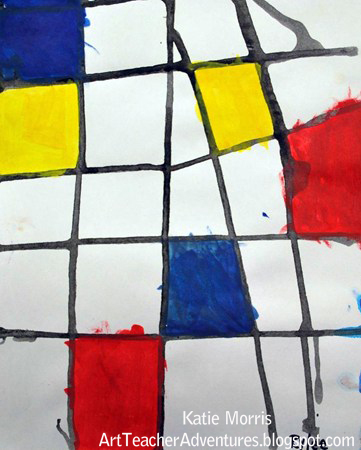 What a fun spin on Mondrian. I even love the name Messy Mondrians. Great lesson!!! Fun idea! 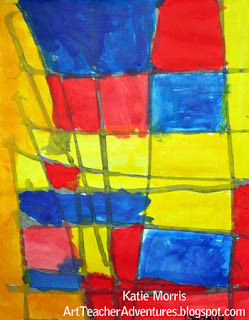 For music my kids are creating rhythm compositions inspired by Mondrian. 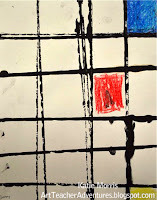 The main gist of the lesson..we have a line of 8 squares, they can color blu-ue (2 squares for a long sound ta-aa) red ta ) yellow (ti-ti ) and white represented on beat of rest, then perform on classroom instruments. Great Idea, nice way to have the kids reinforce their primary colors. Thank you Kate. Will be using this idea with my year 2/3 class in NZ. They are scheduled for 40 minutes. Usually they are a couple minutes late after switching from another class. The first day we went through a Mondrian ppt and discussed several pieces which took probably half the period. I always allow a full 5 minutes for clean up and if students finish a few minutes early, they just start clean up a bit early then read a book. I don't remember anyone finishing super early. 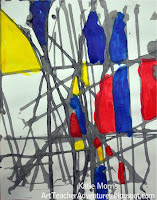 Whenever we paint, some of my kinders work quickly and some could keep going and going. I just have lots of interesting books available for early finishers. Of course a different population might need an adjusted plan.